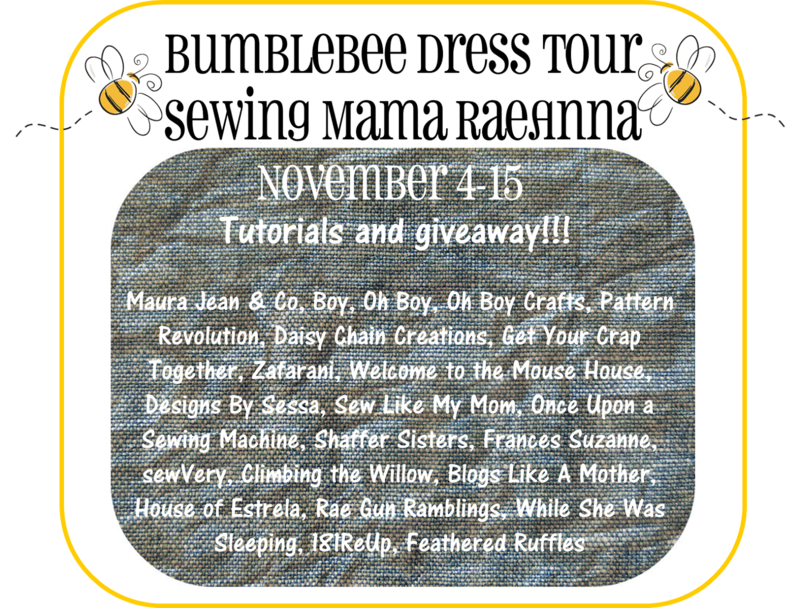 A little while ago I opened my e-mails and read an invitation from RaeAnna of Sewing Mama RaeAnna to a few bloggers to participate in her upcoming blog tour. My name was on that list. I thought RaeAnna must have confused me with one of the famous big blogs that contain 'sleep' or 'nap' in their blog titles. However the idea sounded like so much fun I convinced myself RaeAnna really meant to include me - silly little me - and went ahead and put my hand up saying, 'Yep, I will make a new dress for my Little Monkey, and I will have a lot of fun during the blog tour'. While she was sleeping I made a Bumblebee dress for Little Monkey. I wanted to use lovely blue cotton with flowers on it for the dress and lace for embellishment, but Little Monkey had a different idea. She picked this brown quilting cotton with fun print and declared that she wanted 'this one'. Arguing with a three year old is pointless. It really is. Besides, I liked her choice of fabric. I mean, just look at it! It is so fun and childish! Because the print is pretty busy I decided to omit the ruffles and use piping to embellish the bodice instead. I made piping out of the same fabric I used to line the bodice. I just love the pop of green on this dress! There are two things you need to know about my daughter. One - she loves pockets. Two - she loves buttons (as well as cars, dinosaurs, trains and ice cream. Oh, and her Mummy and Daddy of course). So I added simple patch pockets to the dress and used piping to embellish them... because I am not addicted to piping at all. I mean, not a little bit... which might be a little lie. Self-covered buttons for the back closure? Yes please! Little Monkey loved her new dress! She gasped with delight when I showed her the buttons. We had a lot of fun looking and talking about the characters on the fabric. The pockets comfortably accommodated Lightning McQuinn, the Fast Car (Francesco, the F1 car from Cars 2), and a couple more of her favourite cars, as well as a hand full of small stones, a couple of flowers and some general rubbish, which a three year old consider treasure of course. The dress was an absolute delight to make. I love the timeless style, and there are opportunities to get creative and customise the dress. The pattern comes in sizes 3 months to - wait for it - 12 years! Instructions are clear and photos accommodating every step make the process so easy! Are you completely in love with the pattern? Then you will be happy to know it is only US$5 at RaeAnna's shop during the tour. 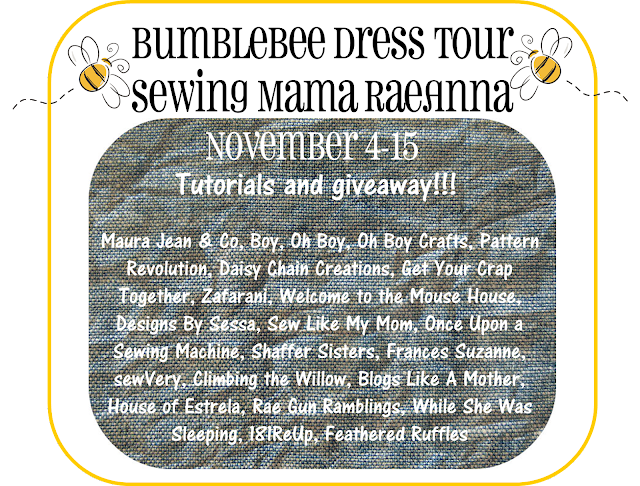 You are also welcome to enter the giveaway for your chance to win a copy of the Bumblebee pattern. Would you like to see what other blog tour participants created using this pattern? Thank you Renee :) When I saw this fabric at the shop I had to buy it :) I am glad LM liked it and wanted a dress made out of it. Oh Jenya - this dress is adorable. I give my 4yo some choice when I make her things. Often it is "Do you like this option 1 or this option 2?" and that's it. I don't have a lot of fabric as I don't have much storage! Hi Jane, I do that too, but sometimes she sees something on the shelf she really wants, so I just go with the flow :) I bought a whole hip of fabric on sale last summer, so there is a lot to choose from! I love your piped pockets! Very sweet. The fabric is gorgeous - I bet my girls would have chosen that one too :) The green on the buttons and piping is a perfect match! OMG how adorable is that dress. Another gorgeous dress Jenya, love the piping, pockets & covered buttons...lucky LM! Little Monkey had done well choosing the fabric and you've done well in co-ordinating the piping, Jenya. Green is the perfect colour. I love how you've added the piped pockets... finishes the dress off well. Hey! Sorry I have been missing for awhile, the whole family was sick one after the other. But anyways! Love the dress and am really digging that fabric. I really like your decision to use green piping, I have not yet mastered the courage to make my own piping, but it's on my list! Oh hope you guys are getting better! I have been intimidated by piping for ages. The first lot I used was store bought and the choice was minimal. I have been making my own piping since then either using store bought bias tape or making my own :) It really is not difficult at all! She did a great fabric choice and I like that you've kept it simple. The dress turned out so cute! This is an adorable dress. Love that print and the piping really sets it off! What a great fun dress! My little girl would look adorable in this too. Thanks for sharing. Pocket, piping and covered buttons... and you still ask yourself if they make your name for an error? Nice dress! I follow you! So sweet dress!! !Nice to meet your great blog!I'm your new follower! OH! I missed this!!! Beautiful dress Jenya. I Like the colors you choosed specially the green, looks very good! !